George Herman "Babe" Ruth, Jr. (February 6, 1895 – August 16, 1948) was a famous baseball player during the 1910s and 1930s in Major League Baseball. He played with the Boston Red Sox, New York Yankees, and the Boston Braves, and hit 714 home runs in his career. Only two players, Hank Aaron and Barry Bonds, have hit more. At the beginning of his career, he was a pitcher. He is widely considered the greatest baseball player of all time. Babe Ruth has been called by many nicknames. Some of the most common are: "The Great Bambino", "The Sultan of Swat", "The Colossus of Clout", "The Titan of Terror", and "The King Of Crash" . Ruth learned to play baseball while growing up in Baltimore, Maryland.His first Major League Baseball (MLB) team was the Boston Red Sox. Ruth began playing as a pitcher. He had some of the best pitching statistics in baseball. The Red Sox won the World Series in 1915, 1916, and 1918. At that time, there was no designated hitter rule in the American League, where the Red Sox played, so Ruth got chances to hit as a pitcher. The team realized that he was also good at hitting. In 1918, Ruth began hitting more and pitching less. Later in his career, he became an outfielder. In 1927, Ruth hit 60 home runs, which was then a record for the most home runs in one season. The record was broken by Roger Maris in 1961 with 61 home runs. Ruth died of throat cancer August 16, 1948. In November 2018, Ruth posthumously received the Presidential Medal of Freedom from President Donald Trump. ↑ "Babe Ruth Statistics and History - Baseball-Reference.com". baseball-reference.com. Retrieved July 24, 2010. ↑ "Babe Ruth Biography". Bio. A&E Television Networks, LLC. Retrieved February 3, 2017. ↑ "HowStuffWorks "Babe Ruth's Sale to the New York Yankees"". entertainment.howstuffworks.com. Retrieved July 24, 2010. ↑ "Baseball Historian - Part of the Sports Historian Network". baseballhistorian.com. Retrieved July 24, 2010. ↑ "ESPN.com: Lovable Ruth was everyone's Babe". espn.go.com. Retrieved July 26, 2010. 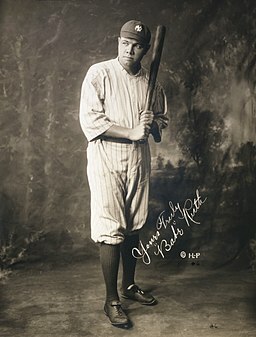 Wikimedia Commons has media related to Babe Ruth. This page was last changed on 6 February 2019, at 20:52.